We were only three days into our planned 10 days of fieldwork and had walked nearly an hour in the bottom of a beautiful, large ravine. 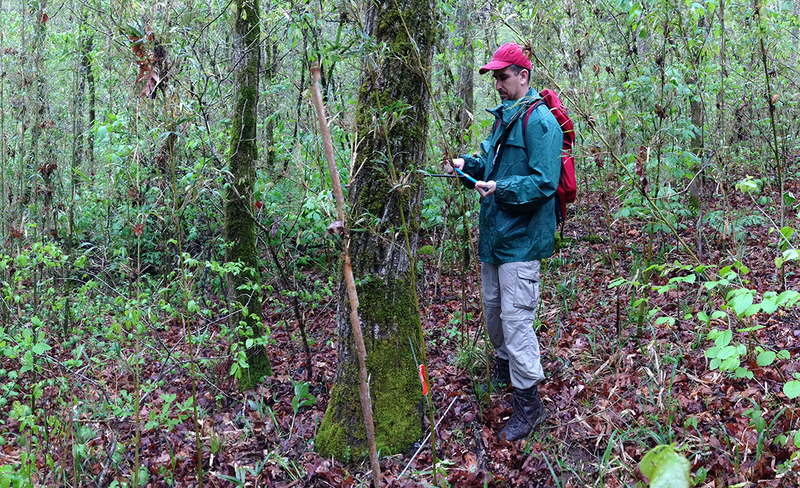 We had not yet seen one individual tree from the less common species we were targeting. It was a narrow ravine at this point and we had been forced to cross the stream at several points. I had already gotten to the point where I said, “Bucket” and had walked through the stream with my trail running shoes. One of the many things that living and working in the south disabused me of was the Yanque tendency to try to keep our feet dry. It makes sense in the Northern Forest where you can get hypothermia in July. 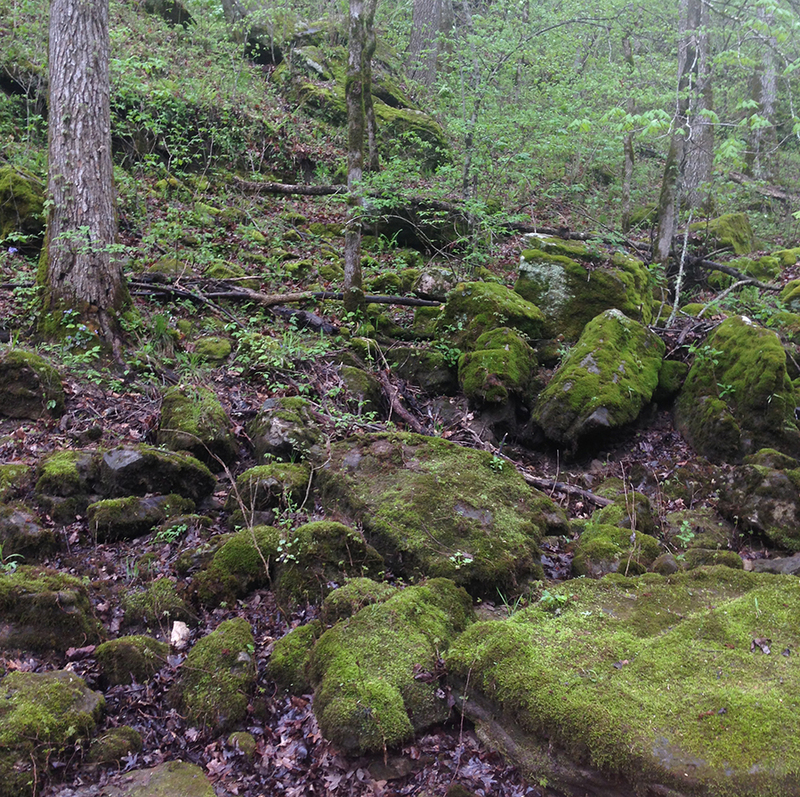 In the South, as long as it is forecast to stay in the upper 60s F or more, trying to keep your feet dry while working in a wetland system borders on a waste of time and energy and, in extreme cases, can be dangerous when hopping moss-covered rocks. It was all interesting, but, to me, a bit disconcerting. We were in Arkansas and the eastern end of Tornado Alley. Tornado season had started slow, but a cluster of tornadoes had hit eastern Oklahoma just days before our trip and we had spent 10+ hours in O’Hare four days earlier because of a series of slow-moving storms and tornadoes in Illinois. 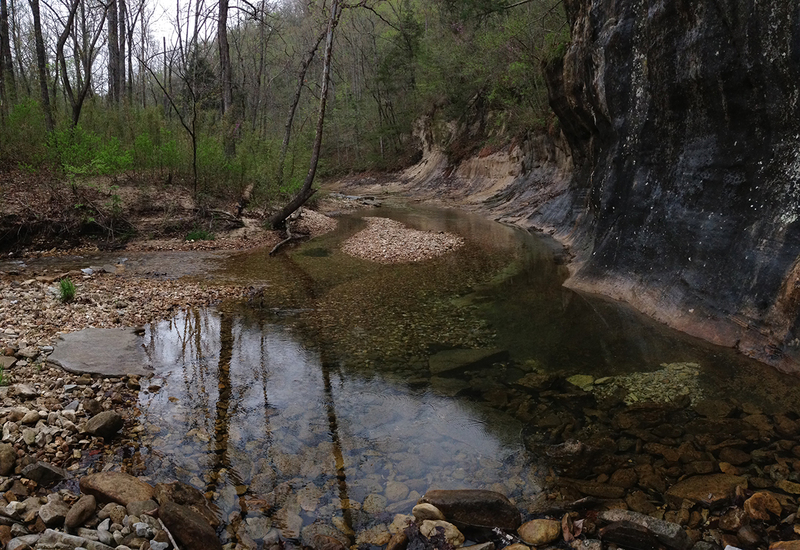 Deciding upon mid April for fieldwork in Missouri, Arkansas, and eastern Oklahoma had sounded great 8 months earlier. I was beginning to question that decision. We turned a corner and the light and temperature dropped again. We all looked at each other and silently asked ourselves what to do next. 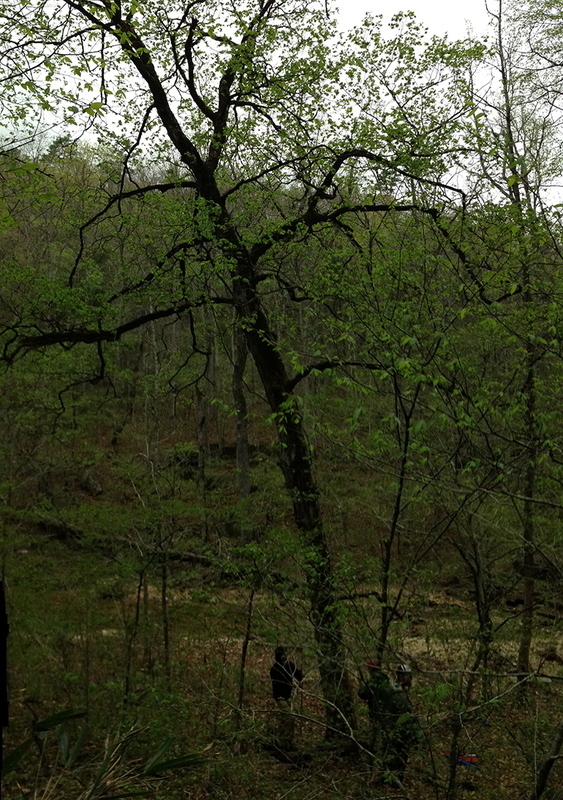 Then the first sugar maple appeared. It was clear there was no turning back. The maple was hollow, of course. Because this species has diffuse-porous wood anatomy, faint rings, and the lighting had dropped by 33 and a 1/3 percent, we couldn’t tell if the wood we retrieved had 40 rings or 100 rings. The tree itself looked old. It was encouraging. We sloshed up ravine. The sky continued to drop and the rain finally started. The markers stopped working on our straws after only sampling about seven trees. Someone had the great idea to duck into a shallow cave, pull out the straws, and number them to 100. Sample numbers would not proceed in an orderly fashion, but the day was not lost to chaos. We took a quick snack break and reset our minds. 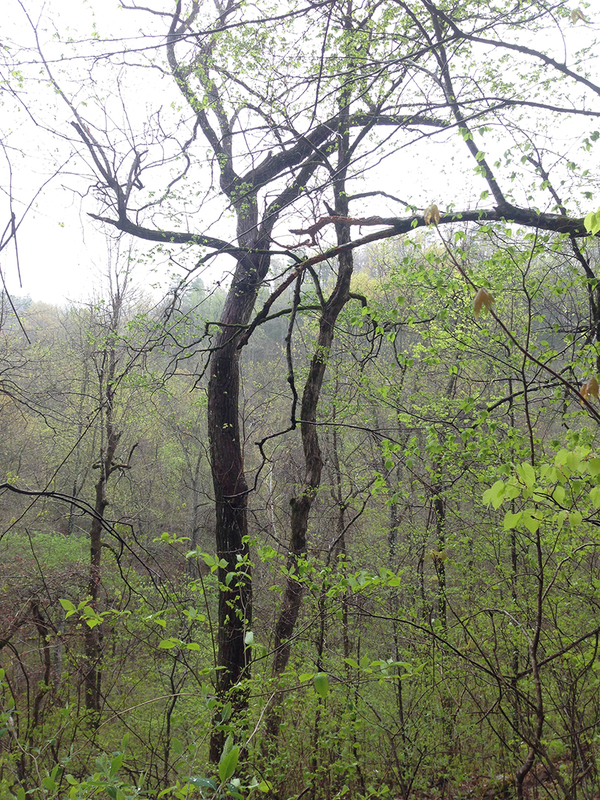 It was going to be a rainy day and we were going to be hiking on wet ground on the bottom of a stony, slippery, uneven ravine. And then, the rain retreated to a mild drizzle and an indicator species appeared to suggest we were on the correct path. Maidenhair fern started popping with a steady frequency. 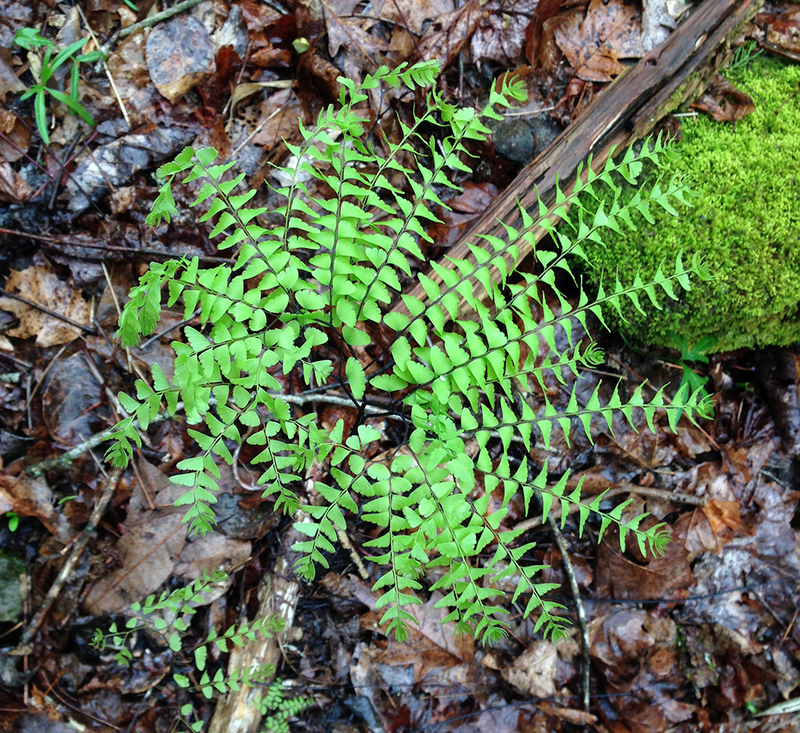 The presence of maidenhair fern indicates soils enriched with cations like magnesium and calcium. Sugar maple is a kind of calcium-loving being. Black walnut, a species I was excited to see in the wild and sample (and a species Park would have taken home if he could have easily found adoption papers at the local pet store), is known to be an indicator of high soil quality. We had seen 1-2 walnuts already. Maidenhair fern told us to expect more. Another rich-soil compatriot we were seeking was bitternut hickory. It started to appear with decent frequency. It appeared we were mining a rich vein. We continued on for the next couple of hours with me scrambling ahead of the corers trying to find trees to sample. They were constantly on the move and we were hitting our groove. Then, finally, an old friend and beacon started beckoning. A Pileated Woodpecker began calling. We didn’t see this one (them), but throughout the day we kept hearing their call. I explained that I often heard them when I started to enter mature to old-growth forests. 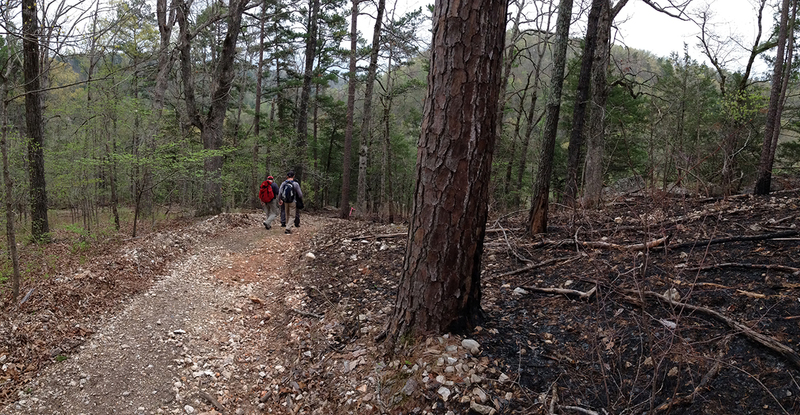 Though we were in the middle of northcentral Arkansas and down in a ravine bottom, the signs of people and skid roads were surprisingly frequent. 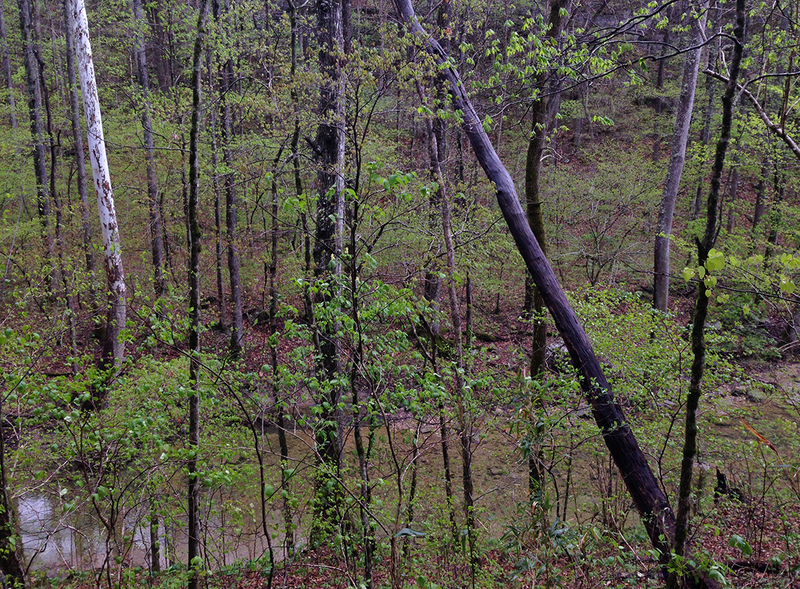 This was not pure old-growth, but old Pileated suggested it wasn’t too bad. Perhaps one of the most interesting aspects of this ecosystem was the amount of cane or bamboo. It is said that one derivation of Kentucky’s name is “Cane-tuck” as cane was common when Europeans were first settling that land. I hadn’t worked in many systems in the eastern US with that density and height of cane/bamboo. * Most of my experience with cane/bamboo was in the northern end of the Sichuan Province near the eastern end of the Tibetan Plateau and Bhutan. 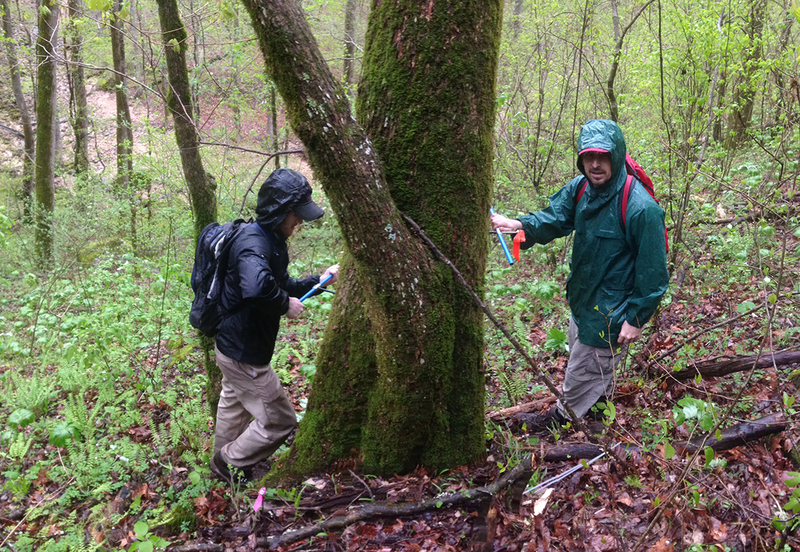 We started hitting a nice patch of red oak (another beast that loves moist, rich soils), sugar maple, and black walnut when I realized we were in a thicket of cane. I paused to soak it in and my mind went back to both the land of panda and monkey (Longxi–Hongkou National Nature Reserve) and and a wonderful movie set in the rich, temperate forests of Bhutan. I had to shake my head a couple times to remind myself that I was in Arkansas. It was a cool moment of minddrift. 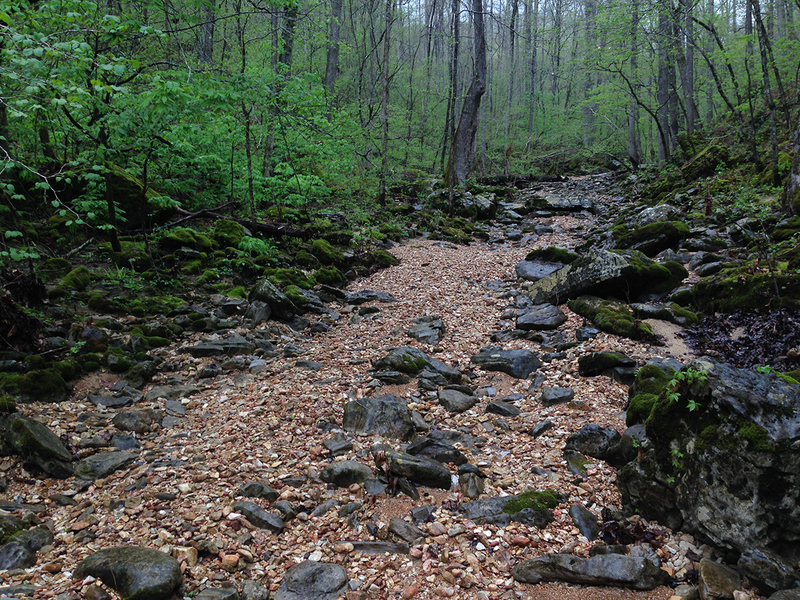 We were in about 6 hours when we hit this streambed. The rain was coming and going, though there were signs it was about to be coming again. We were soaked and starting to run low on energy. There is only so much that trailmix, beef jerky, and citrus can do for you on days like this. The broad, tan streambottom, however, was too inviting to not explore. We found some nice-looking walnuts around the time we started hearing the Pileated again. I do not subscribe to any organized religion, other than perhaps Tengri (especially on damp, grey days like that), but this was a sign. Spring was just starting to come on. We turned a corner and the greenest scene of the trip at that point made itself known. After the long, wonderful winter in eastcentral Massachusetts (go Worcester! ), it was another welcomed vision. Pausing again to think out the remainder of the day (we had most of what we needed), calculate Team Energy, and soak in the scene, I looked upslope to just below the ravine cliff. The terrain looked complex. More importantly, the upper architecture of the trees looked complex. They looked big, too. 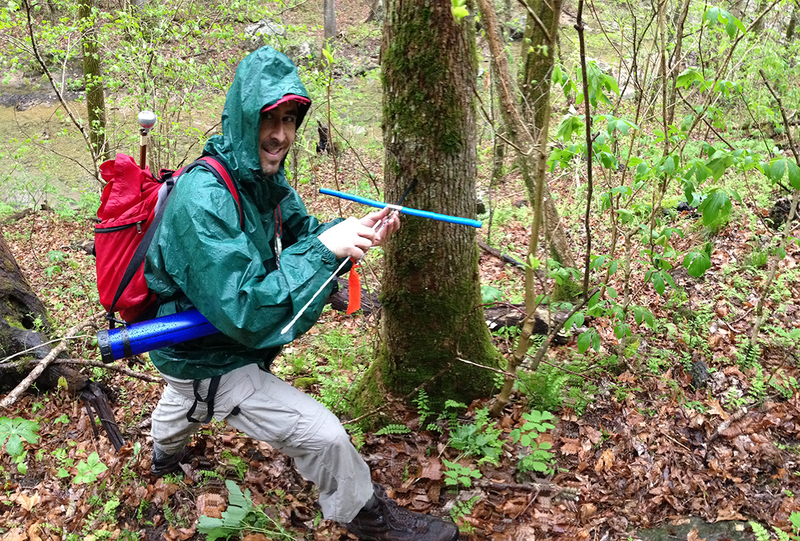 We decided upon one more push to just see what was up there….it was a pile of platinum xylem’ite. 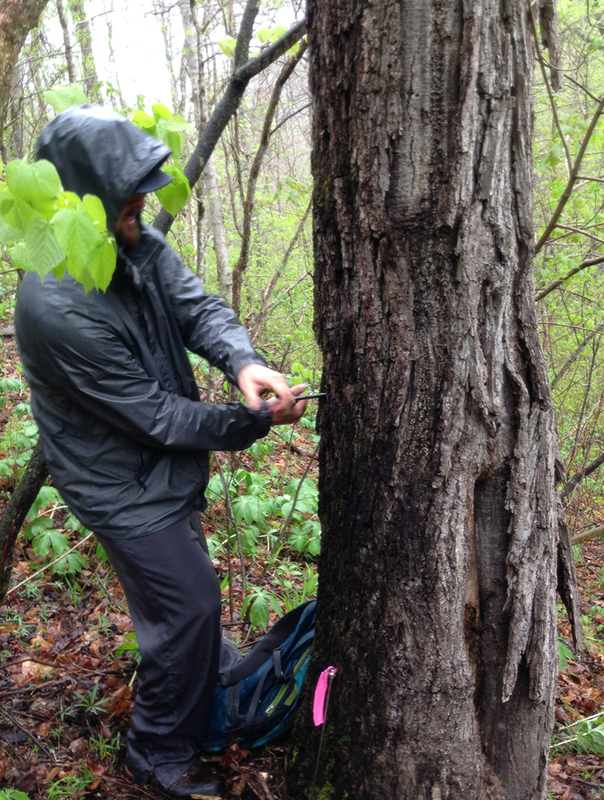 I only have pictures of the large Cucumbertree (Cucumber Magnolia) and old walnut, but believe me when I tell you we also saw and sampled one of the oldest-looking sugar maple on our entire trip. It was joyous. Oh, the way out was filled with heavy rain, stream rising, moments when we didn’t know whether our feet were in the stream or not, a steep & slippery slope slog, and the local BBQ joint closing an hour early. Learning the landscape, ecological relationships in the western edge of the Eastern Deciduous Forest, and getting reacquainted with old friends, flora and fauna, however, has already pushed most the return hike out of my mind. (* in the two years post Hurricane Hugo, the Congaree in central South Carolina was has some nice stands of cane less than 4’ tall).